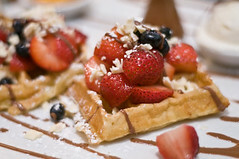 This is the Tutti Frutti waffle I got at Max Brenner's, which is an amazing chocolate factory/restaurant/store. Mine was waffles, white chocolate, fresh strawberries and blueberries, a scoop of vanilla ice cream, toffee bananas, and a beaker of chocolate sauce to pour over the works. Holy cow, was this ever good! Oct 17 Home! NYC was Awesome.